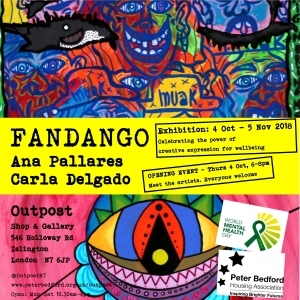 FANDANGO is a joint exhibition featuring the powerful paintings of two London-based Spanish artists Ana Pallares and Carla Delgado. A collaborative project in which art is an important tool for self-expression and communication within society. Combining influences from street art, graffiti, punk aesthetics and decorative forms. At once colourful, complex, symbolic, naïve and full of vitality, with the power to grab your attention and stir your emotions. Both artists show the daily problems that a person with mental issues faces, and the therapeutic power of expressing them through art, helping others to find a common ground to relate and reflect on our own journey within a ‘maddening society’. Ana Pallares, painter and poet, born Barcelona 1993, has for many years expressed her mental health problems (traumas, panic, paranoia) in her paintings with openness and honesty. In doing so she been able to develop a unique artistic practice, make positive personal progress, and achieve growing popularity within the art world. It was discovering graffiti as a teenager that inspired Ana to explore different artistic practices, including painting, illustration and poetry. She previously started a Fine Arts degree, but soon realized that it was not her way of understanding Art, and continued learning on her own. Ana’s work reflects on pain, death, sexuality, her relationship with society and other intangible realities. She strives to find and attach new meanings to these realities, hoping to present them in a healthier more manageable way: ‘Ultimately aiming to turn destructive feelings into constructive action’. She describes her work as ‘ironic, expressive and obsessive’. Interested in ambiguity as it plays with the surprise effect, Ana finds great joy painting the weird faces in her works with rainbow colours. She says, ‘Some people feel lost looking at them, whereas I feel I could not have expressed the tragicomedy of life in a better way‘. 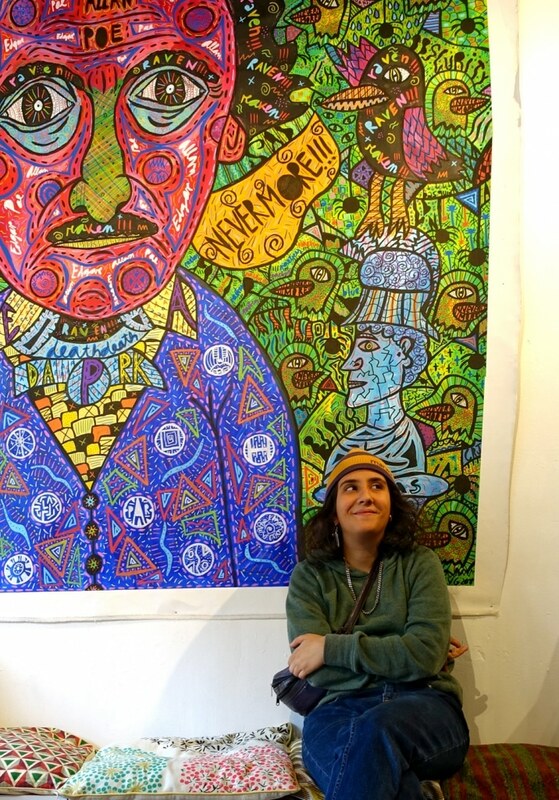 Carla Delgado, born Barcelona 1989, is an artist and art facilitator with a strong belief in the use of the arts as a tool for transformation and social inclusion. She has been working closely beside Ana, helping her to overcome her personal crisis, gain independence and to keep a healthy relationship with herself, family and peers. Carla has also formed a long-term creative collaboration with Ana, whilst supporting her. She has developed a dynamic body of her own artwork, influenced by music and Street Art in Barcelona. Her current work of grafitti-derived decorative forms is charged with personal symbolism, combining techniques using pastels, acrylics, markers and collage. 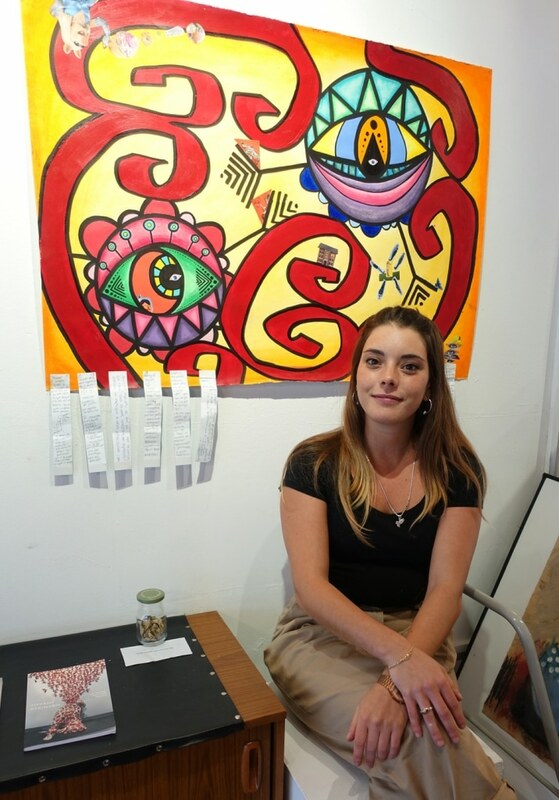 She aims to reflect on different psychic and consciousness states while seeking to expand her understanding of herself, the world around and the power of art for social impact and wellbeing. PBHA are proud to provide a platform for both young artists to showcase their talents and sell their work in our Supporting Makers programme at Outpost.